Here’s how ‘The General’s Daughter’ star reacted to her former classmate in high school who wished for her forgiveness over a bullying incident many years back. 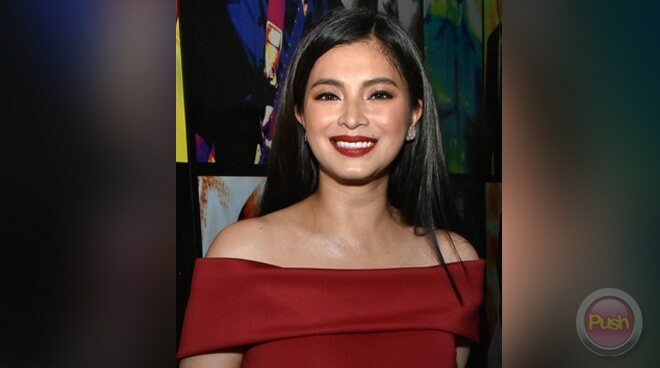 Actress Angel Locsin was moved by an unexpected message she received from a former bully in high school, who wished to make amends for their awful past, many years later via social media. 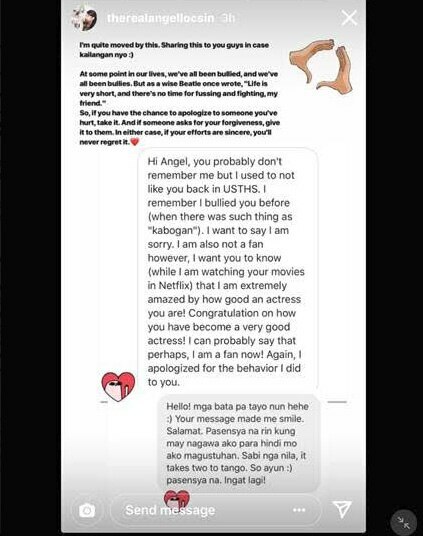 Through her Instagram Stories this morning of Friday, March 29, The General’s Daughter star shared a screenshot of their conversation initiated by the said unnamed classmate she knew from her previous school, the University of Sto. Tomas Junior High School. “Hi Angel, you probably don’t remember me but I used to not like you back in USTHS. I remember I bullied you before (when there was such thing as ‘kabogan’). I want to say I am sorry. I am also not a fan, however, I want you to know (while I am watching your movies in Netflix) that I am extremely amazed by how good an actress you are! Congratulations on how you have become a very good actress! I can probably say that perhaps, I am a fan now,” the person wrote. Angel, despite having been the victim, reciprocated by also making her apology if ever she may have done something to trigger the other party. “Hello! Mga bata pa tayo nun hehe. Your message made me smile. Salamat. Pasensiya na rin kung may nagawa ako para hindi mo ako magustuhan. Sabi nga nila, it takes two to tango. So ayun. Pasensya na. Ingat lagi,” she said. For the 33-year-old star, the takeaway in all this is that no good will ever come out from holding onto a grudge as “life is very short”. “At some point in our lives, we’ve all been bullied, and we’ve all been bullies. But as a wise Beatle once wrote, ‘Life is very short, and there’s no time for fussing and fighting, my friend,” she said. “So, if you have the chance to apologize to someone you’ve hurt, take it. And if someone asks for your forgiveness, give it to them. In either case, if your efforts are sincere, you’ll never regret it,” she added.